Protecting the roof of your RV is vital. The smallest leak can cause water damage that eats away at your investment, while harsh weather and time leave their mark. We highly recommend regular roof maintenance because of the headaches it can save you down the road. If you already have a leak, we can detect and repair it. If your roof is sound, annual inspection and sealant application will protect you from future issues. RVs are often exposed to extreme weather that can damage the roof and the things on it, such as air conditioning units, in-motion satellites and vent covers. Iron Horse RV can replace broken vents and skylights that have been damaged. We also replace AC gaskets and other parts that may rattle loose with routine use. Iron Horse RV uses a proprietary material called Vortex to protect the outside of your RV. This polyurea and polyurethane blend is applied as a spray, before drying and hardening. 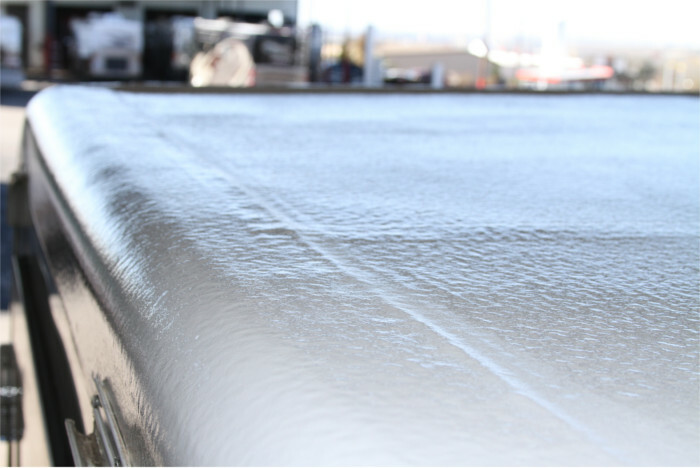 To give you an idea of the protection Vortex can provide for your roof, the tensile strength of Vortex is 3,000 PSI (pounds per square inch), and the tensile strength of concrete is around 3,500 PSI. One of our customers went through a terrible hailstorm after getting Vortex on her roof. Everything on the roof was destroyed, but the roof itself was completely unscathed. You also have the option of a roll-on roof for $95/linear ft. Contact us today to discuss your roofing needs!